The Little Book Club :: Did you get your Blume? OK gang…now that we’ve all tricked and treated to our hearts content, let’s get our Blume on! 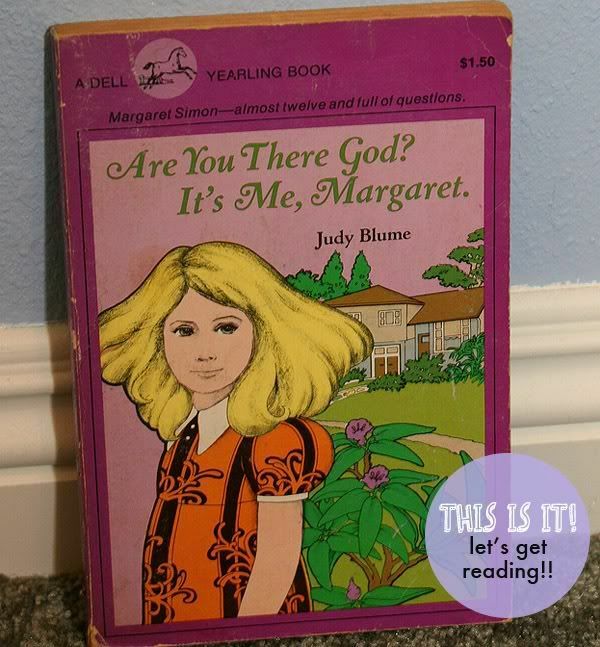 We’ll be reading Are You There God? It’s Me, Margaret. We both have our copies….now you need to hit the book store, thrift store, Amazon , the library and grab one for yourself! We’ll be checking in with ya in a few weeks to see how you liked it—or if it was as good as you remembered!! Tagged with Judy Blume, vintage children's books. I have that exact same copy. And I love this book. I LOVE this book. So awesome. Thanks for the reminder– I’ll get on that! Also, I had this version, too! Totally forgot! I’ll pick it up this weekend. i got an old copy of “the mouse and the motorcycle” that i’ve been reading to the kids. i LOVED that book when i was little. i’m afraid reading it as an adult is really taking the bloom off. i’m almost afraid to crack open that gorgeous, yellow copy of “ribsy”. This is the edition I have…will start reading (re-reading) it this week !